Global Navigation Satellite Systems (GNSS) are subject to disruptions from environments like urban canyons, mountainous and forested terrain, as well as intentional jamming. And, of course, GNSS doesn’t work underwater. The need for autonomous and unmanned navigation systems to overcome these vulnerabilities has led to the development of multi-sensor navigation systems using data from both GNSS and inertial sensors. Inertial navigation, the only form of precise navigation that doesn’t rely on external references, relies instead on knowing initial position, velocity, and attitude, and measuring attitude rates and acceleration to determine position. This ability makes inertial navigation unjammable. 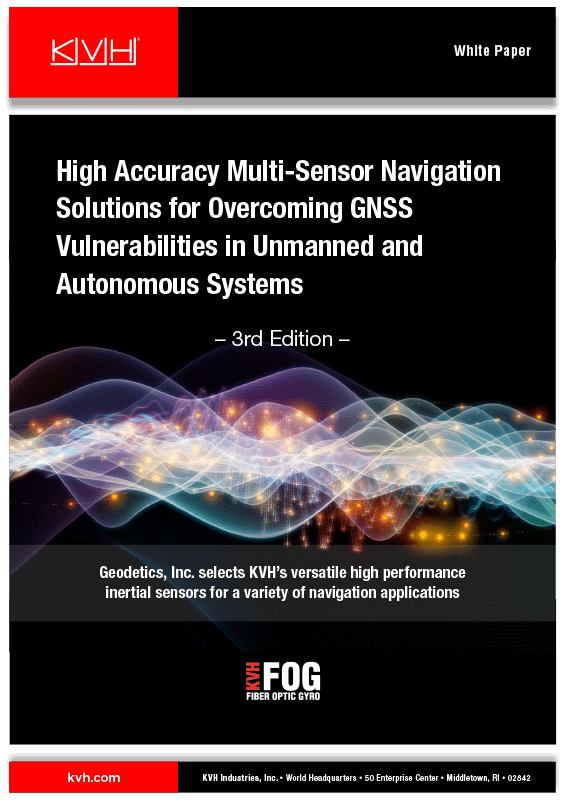 This paper examines how Geodetics, Inc., integrates KVH’s high-performance fiber optic gyro (FOG)-based inertial measurement units (IMUs) with GNSS, resulting in extremely precise sensor-fusion solutions.